BBQGuide.com - Barbeque, Grilling, Meat Smoking, Flubber and Fun! If you buy a new grill everyone will be happy! How to bbq you ask? Everything you need in one stop is here! You can buy all of the must have barbecue gear, meats, and ingredients in the Essentials Store. 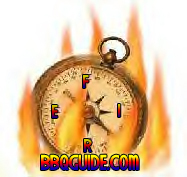 You can read reviews about the latest and greatest barbecue books in the book reviews section. We've even compiled an extensive list of barbecuing and grilling tips and techniques to help make all your barbecue experiences some of the most memorable. I hope you find all of the information on this site as useful as I have. I made the AMAZON store up with products I either HAVE or would LOVE to have. Buying through my store no matter where you end up on AMAZON you will be supporting this site and getting top notch gear at low prices and most items ship right to your door for free! If you CLICK ON THE AMAZON banner IN the store you will be taken to the main AMAZON page where you can search for anything you like! How to bbq a steak you ask? CHECK THIS OUT ! What you should know about them. If you need a top of the line marinade, I recommend Daddy Natty's sauce! A deep fried turkey or even a deep fried HAM would be worth checking into. You have to start with a raw piece of pork. I goggled THIS RECIPE for the ham. Always ask if your guests want a side of your favorite barbecue sauce! Stop by my IGOTCOFFEE CAFE! In response to some searches coming in, I made the page "HOW TO BBQ or BARBECUE". Be sure to bookmark me and of course, your input is very valuable and welcome. Want your very own site? Read HERE! I can help. Contact me for the short list of domain names I have for sale and I can get YOU on the Internet. What to HAVE at a barbecue seems to be a question all of us face at some point in life. I'm thinking you should make a head count of how many you will be serving (and figure a couple more surprise visitors once the smoke hits the air). Let's face it, kids don't usually enjoy STEAK nearly as much as us adults. So lets leave the hot dogs and hamburgers for them. You don't want to make up a pile of ribs? Lets consider your budget. How much do you want to spend on all this? Obviously the money you have dictates what's going to be served. How about asking each guest family to bring a covered dish? Have one person who is in contact with all of your guests to coordinate all the side dishes and desserts to avoid duplication. If you need a great fill in Barbecue Sauce click on the STINK EYE link! My FAVORITE sauce for everything. From Pancakes to Chip Dip! Stink Eye is on the thicker side where Uncle Bob's Smoky Mountain sauces make for a good mop and marinade sauce. If you like spicy then the Uncle Bob's HOT will burn a trail of goodness all the way down to your tum tum. Lets get back to the main dish, the MEAT. Chicken smells sooooo good cooking doesn't it" Lets get some legs, wings and breasts. Stick with FRYER size pieces so they cook quicker. You'll need a digital meat thermometer from the Essentials Store so you don't serve the meat all bloody on the inside and burned to a crisp on the outside. Oh.. chicken thighs... I find that for the money these are a total waste because of them being mostly bone, fat and skin.. More on the technique later. Moving on to the MOO... sirloin steaks can be cut in half for two very nice servings. Very tasty and even healthy as they are the lowest in fat of almost any other steak cut. Be sure to choose CHOICE grade beef. Pork is ungraded but in the USA it IS "INSPECTED". Pork ribs are very popular as well and tenderloin medallions that cook very quickly. These can be marinated in something like Italian dressing for a special taste or sprinkled with your favorite rub. On the steaks, a chuck steak if marinated and is CHOICE grade would be the absolute cheapest "steak" you could serve but it's kind of tough. Seafood is touchy to have as it takes attention to detail in every aspect. Careful handling of your items is very important as to not to promote spoilage. More to come but this article should get you going! CONTACT ME with any questions or suggestions. Feel free to use the CONTACT PAGE to share your ideas for me to post here. If you are looking for cop gear or other kinds of real MAN gear, shop my affiliate RED DIAMOND ONLINE! 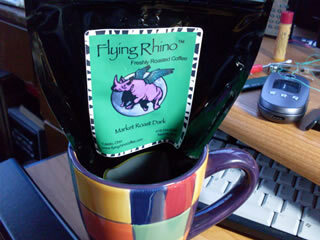 Click on the Flying Rhino logo! Another Toledo Ohio home grown business with tons of goodies. As I type this I'm drinking my last cup of coffee using their fresh roasted beans! I'll never be able to drink Starbutz again! Superb selection of fresh roasted beans. The Milenium MUST HAVE LIST! Johnston Honey all natural Beeswax Candles. Forget YANKME Candles.. these beeswax ones will get your stinger buzzing! Buy a case of Hickoryworks Shagbark Syrup! Okay so it's not from the SPY WHO SHAGGED ME but it's...BETTER! I can't say enough about the STINK-EYE Barbecue Sauce (yes buy a case). Don't let the name fool you; its a GOOD stink! Uncle Bob's Smoky Mountain sauces. Not MY Uncle but you may CRY Uncle after a swig of that HOT SAUCE! If you are shopping for a gift for me, please order one of each from these super people. I don't recommend something I haven't tried and trust me I've tried all these items with YUMMY experience! The photo guide on my NO TOOLS RIBZ is a good place to start! If you are going to be grilling PLEASE be careful and whatever you do.... HAVE FUN! Credit given where credit is due. Let's 'QUE! As you browse the site, you will see a wide variety of recipes listed and not just barbecue items. You should be able to make a very memorable five course meal with what I have here for you. Of course you can send me an invite and I will surely help you set the place setting! Grilling and Barbecue isn't a hobby done just in summer. Once you and your family have acquired the taste for that smoky juicy food you will want to do it year round. So please bookmark this site and use all the recipes and be sure to email me to tell me what you liked or want! If you would like to help support this site and offset my expenses of keeping this site free, check out our great sponsors, the 'QUE Store,. Thanks in advance! Email me and tell me if you like my barbecue recipe site!